All songs by Donovan P. Leitch, except 08 music by Donovan, words by William Butler Yeats. · There is another album titled The World of Donovan that was released by Marble Arch Records in the UK in 1969. · Epic released this album for those fans who wanted to delve a little more into Donovan's catalog without getting each of the albums. 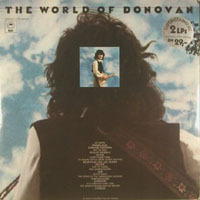 · Since HMS Donovan was not released in the USA, The World of Donovan marked the first album release of the songs in the USA.